The Hindu theology believes in the doctrine of Trinity (Trimurti). Brahma, the Creator, Vishnu, the Preserver, Shiva, the Destroyer. Among all them Vishnu is a god who incarnates from time to time to protect the earth and mankind from evil perceived as demons. In the Age of Treta (Treta Yug), Vishnu took incarnation as Rama who was born in Ayodhya as eldest son of Ayodhya’s king Dashratha. The story of Rama was first known from the Ramayana, a great Sanskrit epic by Valmiki. In the Ramayana Rama has a life full of struggles and passed through a chain of ordeals. His consort Sita was stolen by Lanka’s demon king Ravana. 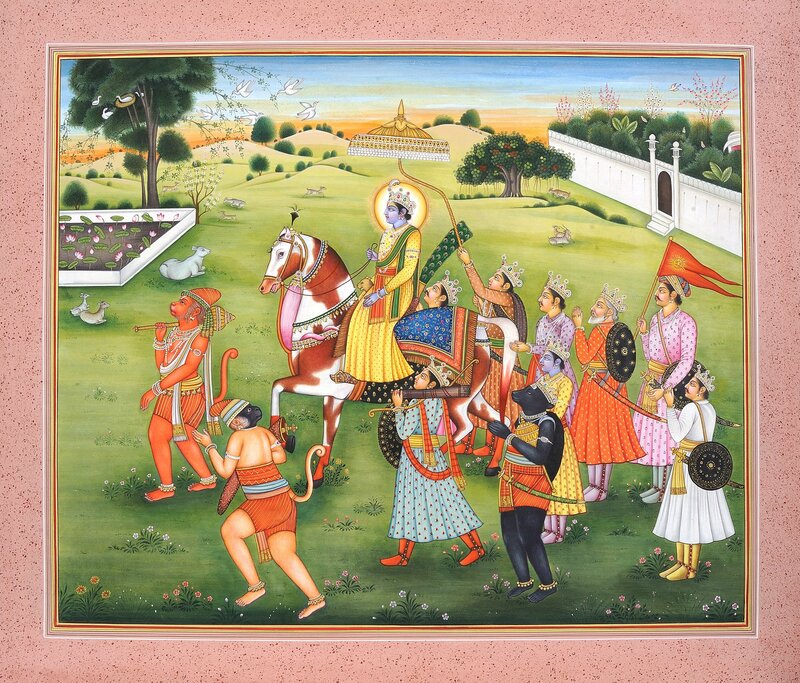 Though not a specific event, the miniature manifests people’s reverence for Rama. It represents him as going on some errand in the form of a procession. He is attended upon by his brothers, Hanuman and Jambavan among others. In the procession Rama is seated on an elegantly saddled white horse with brown patches The figure of Rama is clad in ‘Pitambara’ – yellow gown, green sash, red waistband, nimbus around hs face and a crown with crest. Lakshmana, his younger brother, is walking along with the horse carrying bow and a quiver of arrows on his shoulder. Other two brothers Bharata and Shatrughana are carrying Chauri and umbrella (Chatra) in their hands. Hanuman, a great devotee and servant of Rama with the monkey face and a mace on his shoulder is walking ahead of Rama’s horse. The painting has influence of Pahari school of painting Kangra style with beautiful background consisting of flowering plants, walled garden and a lotus pond.